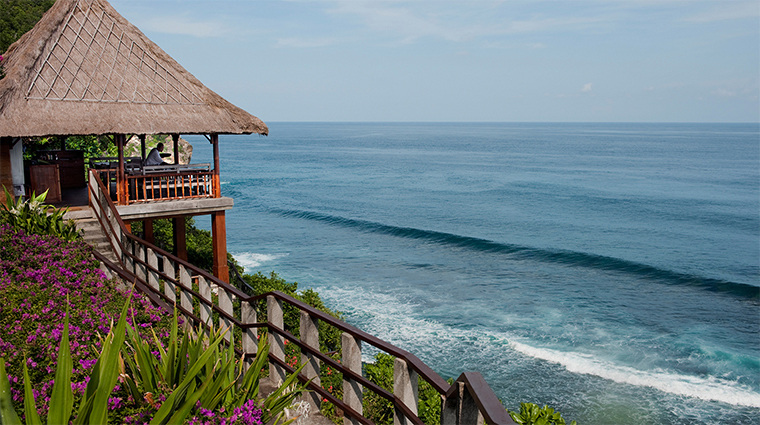 The Indian Ocean beckons from Bulgari Resort Bali. 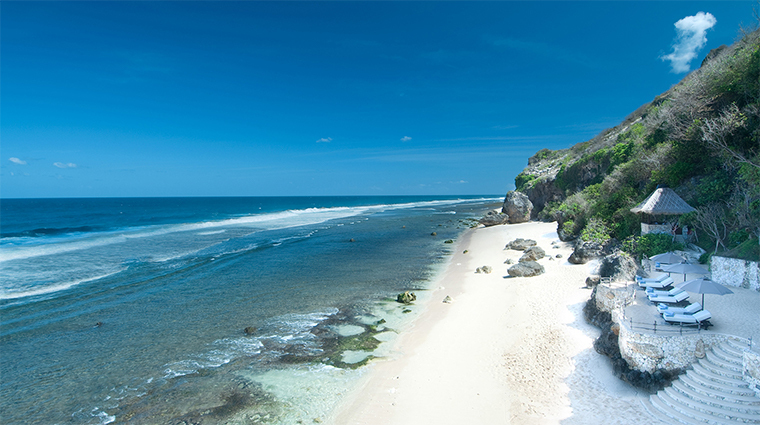 As you stand on the clifftop nearly 500 feet above sea level on the very southern tip of the Indonesian island, spectacular views spread out before you. 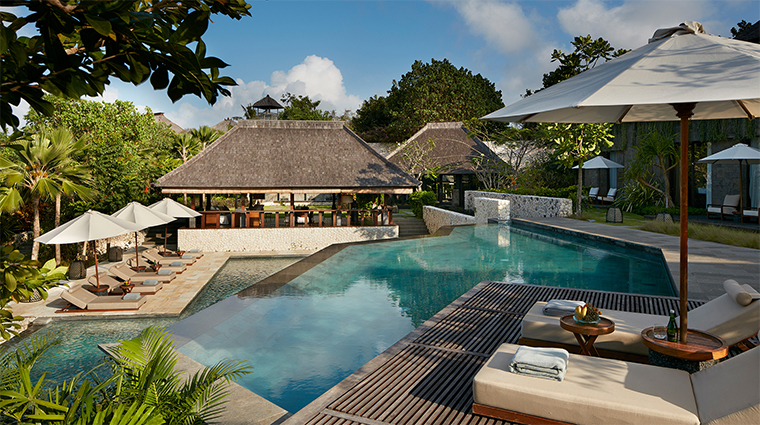 The resort seamlessly blends two worlds — its 59 villas and five mansions feature sophisticated custom Italian furnishings by Milan-based architectural/design firm Antonio Citterio-Patricia Viel and Partners complemented by traditional Balinese design elements found throughout the property. As you take the buggy ride down the Italian cobblestone path to your frangipani-scented accommodations, you’ll notice many features from the local volcanic landscape amid the lush tropical gardens. 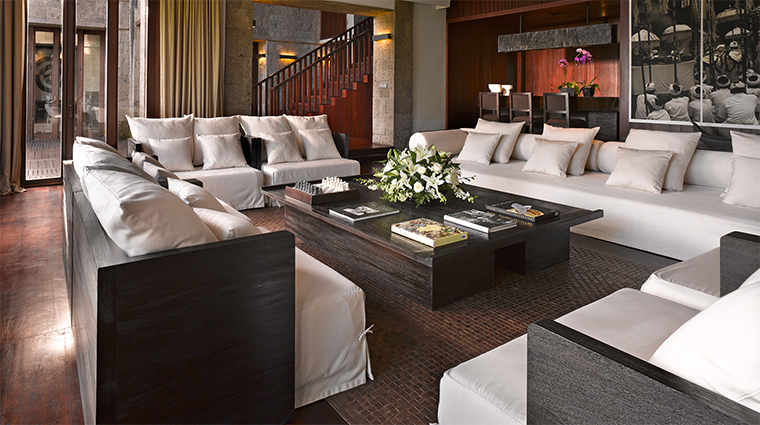 Be sure to visit the two Bulgari stores onsite. One spotlights beautiful Bulgari watches, fine jewelry and a wide selection of fragrances, while the other shop offers an inspired selection of wooden statues and cultural art pieces. 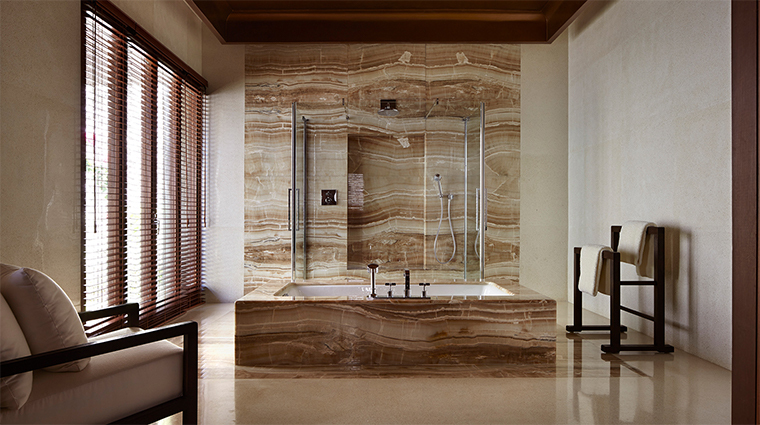 Pampering is taken to another level at the oceanfront Bulgari Spa. 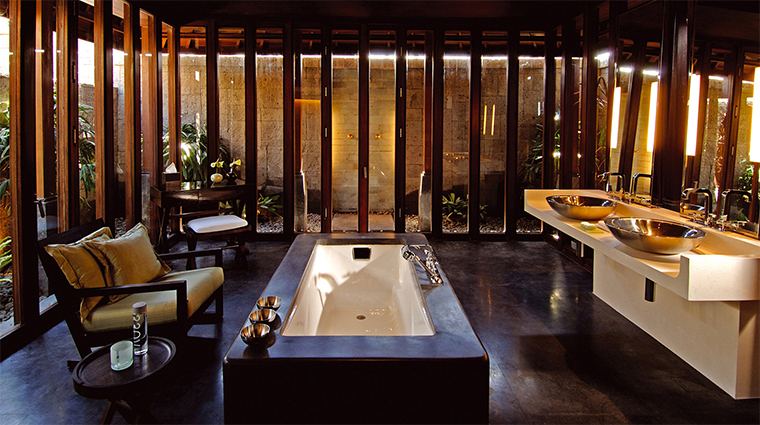 Be sure to check out the exclusive Bulgari Signature Experiences — one designed for couples involves four highly trained therapists (two for each guest) who provide a harmonious, synchronized body massage with exotic oils and healing herbs. Want to go to the beach? Hop a ride on the inclinator, an open-sided carriage that leisurely carries you down the cliff to the resort’s private stretch of sand and provides stunning views of the surrounding jungle during the ride. 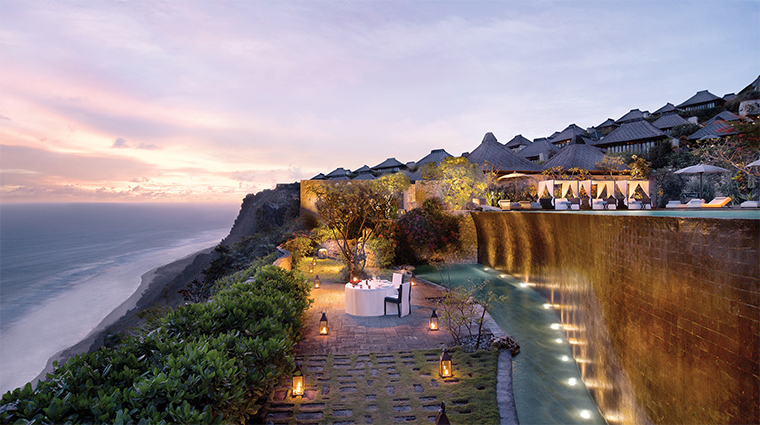 Take advantage of your surroundings and visit one of Bali’s iconic religious monuments, Pura Luhur Uluwatu. 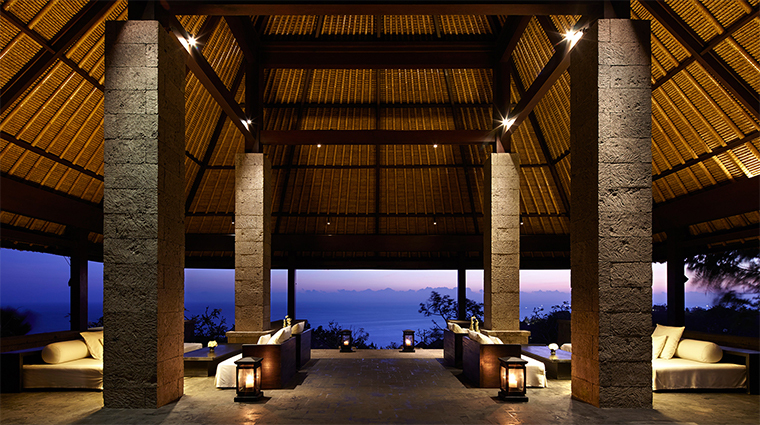 This Balinese sea temple is only a 10-minute trek from the resort and offers stellar vistas, especially at sunset. 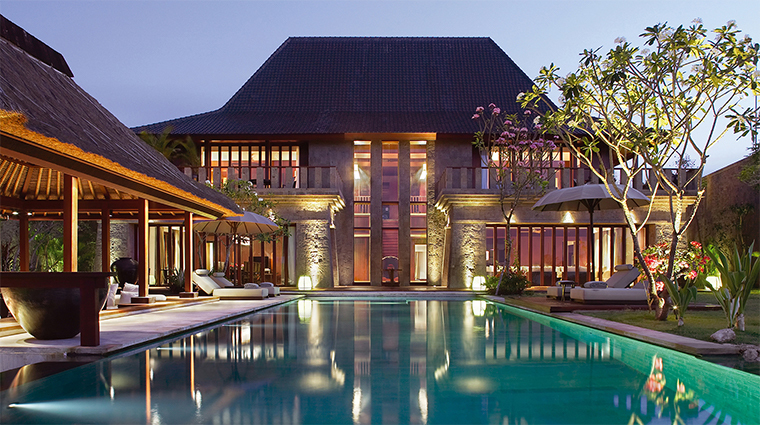 History is everywhere at this Indonesian resort. 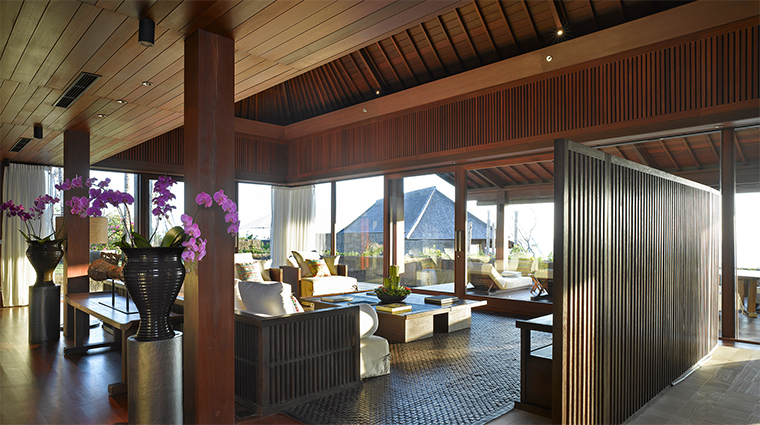 An antique Javanese Joglo house, painstakingly relocated to the property piece by piece, serves as the main entrance to the spa. If you are feeling romantic, the onsite chapel may tempt you to tie the knot. 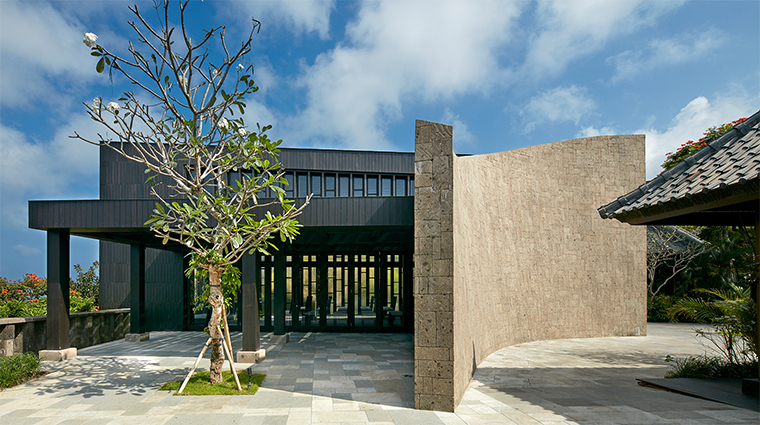 The first Bulgari-branded wedding chapel in the world, the stylish venue features Paras Kerobokan stone from Bali and handcrafted floor-to-ceiling windows overlooking the endless blue ocean. Nearly two miles of white sand awaits you for relaxation, running or long beach walks. For your convenience, a raised beachfront platform has been cleverly designed so that you can enjoy your time by the water during both low and high tide. If you are afraid of heights, sit on the little wooden seat at the back of the inclinator. 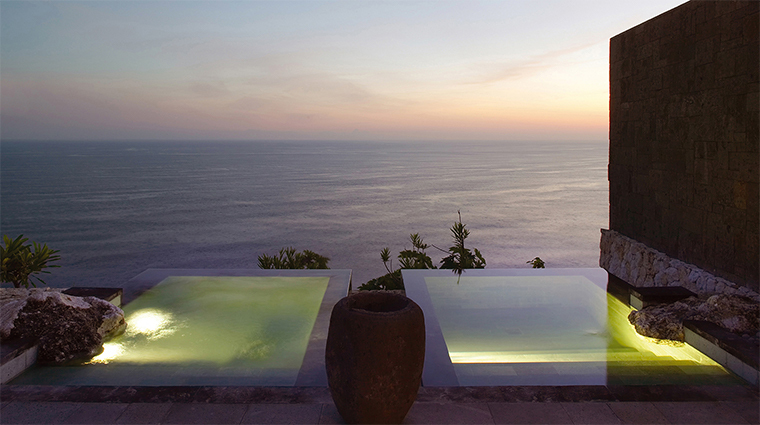 Let the brave ones gaze out from the glass front elevator that drops you down the cliff to the beach below. 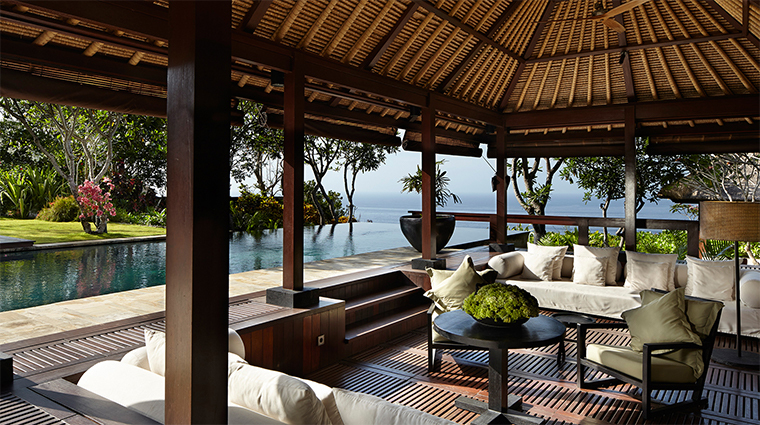 There are five villa accommodation categories from which to choose. 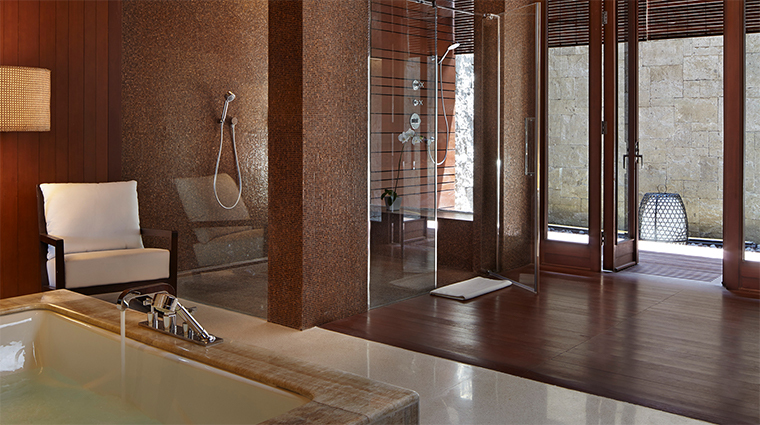 Each of the 59 luxurious spaces has a private infinity pool and beautiful tropical garden. 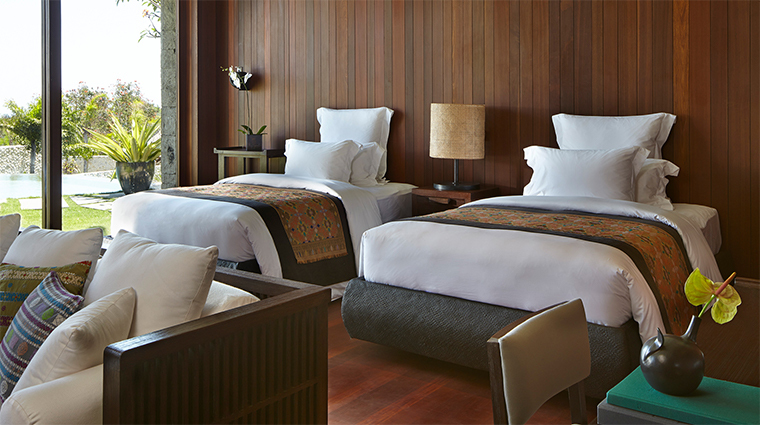 The lavishly appointed villas have huge designer-made beds and either a comfortable couch or two loveseats for relaxing, reading a book or taking in the amazing ocean vistas that dominate the living space. There are also five multi-level mansions offering a choice of two, three or five bedrooms with a maximum sleeping capacity of 12 people. 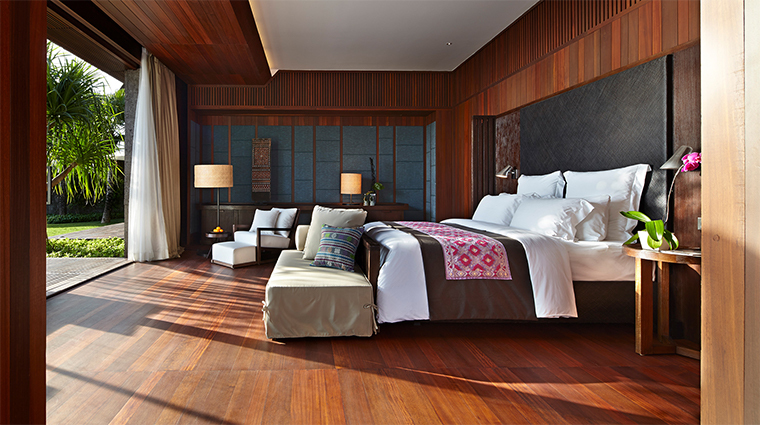 The luxurious mansions at the Bali hotel feature fully equipped Miele high-end kitchens, Bang & Olufsen audio and video systems, landscaped wrap-around gardens and private swimming pools with sun decks. 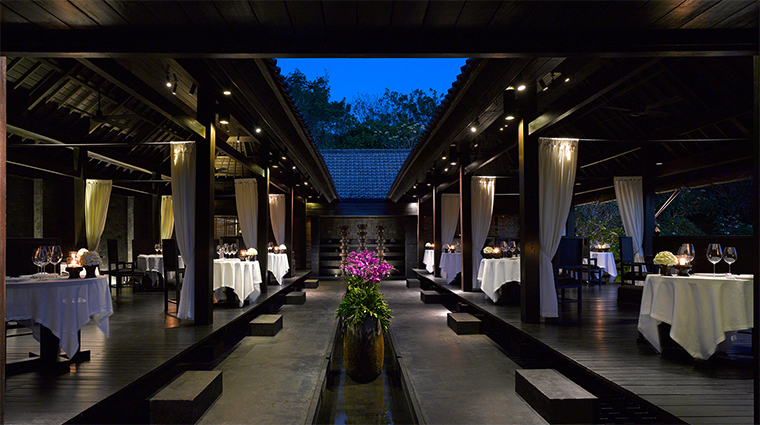 Il Ristorante – Luca Fantin offers a romantic Italian dining experience overlooking a stunning reflection pool. Try the mozzarella-buffalo-cheese-stuffed ravioli served with marinated raw swordfish. 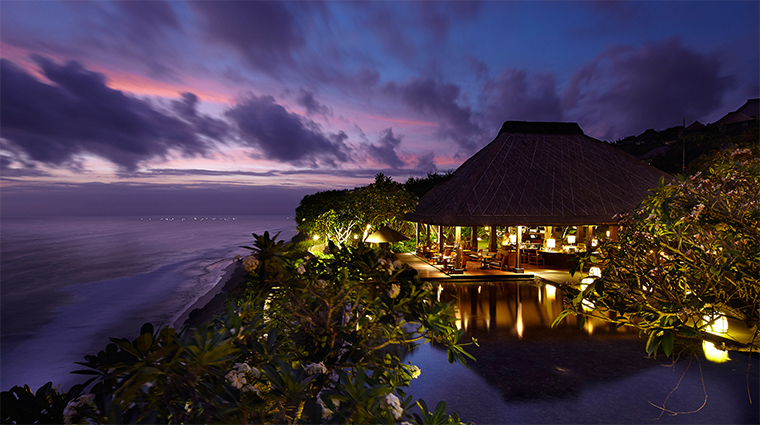 The range of fish on the menu at Il Ristorante changes daily according to the morning’s catch in Jimbaran Bay. Pair the day’s selection with one of the 200 wines on offer. 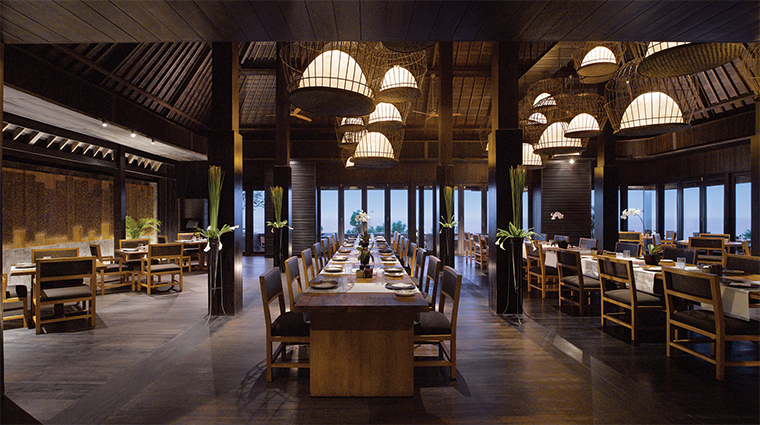 Sangkar Restaurant is for more casual dining, with authentic Balinese dishes and classic Indonesian fare. 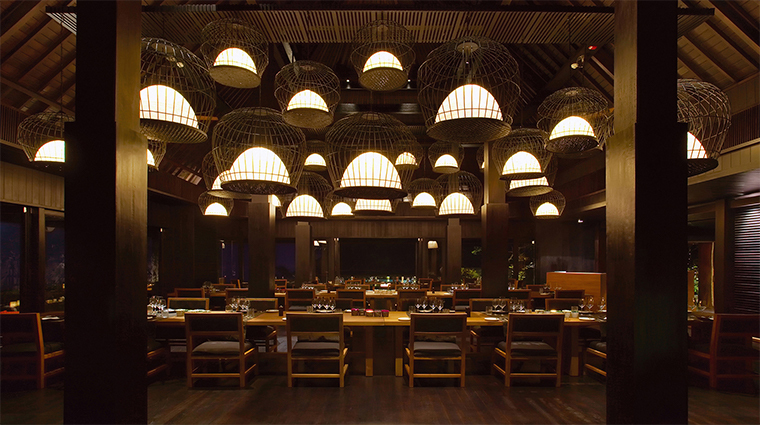 Order the tender pork ribs wrapped in banana leaf with local herbs and spices or the succulent scallop dish with lemon lobster. Casual cliffside dining at La Spiaggia focuses on classic, locally caught seafood. Barramundi is often on the menu, but the lobster is a real winner, cooked with delicate herbs and a spicy Balinese sambal matah (peppers, lemongrass, garlic and shallots).